Benjamin Franklin stated in 1773, “There never was a good war or a bad peace.” Idea: Children could comment on his statement. Benjamin Franklin published Poor Richard’s Almanack for the first time in 1732. He wrote under the pseudonym Richard Saunders and published the almanac yearly through 1758. Here he penned some of his most famous lines, including, “A penny saved is a penny earned.” Children could read, write, and illustrate some of his sayings after they have visited: http://www.poorrichards.net/. Kid Inventors’ Day Is Today! Kid Inventors’ Day is today. This day was chosen because it is Benjamin Franklin’s birthday. Franklin was a prolific inventor, creating bifocals, the Franklin stove, and even Daylight Saving Time. Children can learn more at: http://www.kidinventorsday.com/. Muhammad Ali (born Cassius Clay in Louisville, Kentucky, 1942; died Scottsdale, Arizona, June 3, 2016) was a former heavyweight boxer. He carried the torch for part of the opening ceremonies for the 1995 Olympic Summer Games in Atlanta, Georgia. John Bellairs (born Marshall, Michigan, 1938; died Haverhill, Massachusetts, March 8, 1991) was a children’s author. He published at least 31 mystery and suspense novels. His work includes The Curse of the Blue Figurine and The House with a Clock in its Walls. Edward Gorey illustrated many of his books. Children could investigate a website devoted to him: http://www.bellairsia.com/. Robert Cormier (born Leominster, Massachusetts, 1925; died Leominster, Massachusetts, November 2, 2000) was a children’s author of at least eighteen books. Two of his works are The Chocolate War and I Am the Cheese. Children could read the transcript of an interview with him at: Cormier Interview. They could learn more at: Robert Cormier. Benjamin Franklin (born Boston, Massachusetts, 1706; died Philadelphia, Pennsylvania April 17, 1790) was a statesman, writer, printer and much more. He signed both the Declaration of Independence and the Constitution. He published Poor Richard’s Almanack. He invented many items, including bifocal glasses and the lightning rod. He created the first fire company and the first free library. Idea: Children could make a timeline of his life and then decide whether he made the most contributions to science or to the freedom of America. Ben Franklin of Old Philadelphia, by Margaret Cousins, is an excellent source of information. Shari Lewis (born Shari Hurwitz in New York, New York, 1934; died Los Angeles, California, August 2, 1998) was a puppeteer and a leader in children’s educational television. The creator of the puppet Lamb Chop, she published at least 60 children’s books. Idea: Bring in materials to make puppets of various kinds. Consider sock puppets, stick puppets, even finger puppets. Children could produce a puppet show. Michelle Obama (born Chicago, Illinois, 1964) is a former First Lady of the United States. Married to Barack Obama, the 44th President, she is the mother of Malia (born 1998) and Sasha (born 2001). She was a lawyer before she began helping her husband’s political career. As First Lady, she devoted time and energy to Let’s Move, a program to reduce childhood obesity and increase children’s knowledge of healthy lifestyle choices. Children can learn more about her at: Michelle Obama. Janet Stevens (born Dallas, Texas, 1953) began illustrating books for children in 1978. Today she creates her images using Adobe Photoshop and other technology tools. She received a 1996 Caldecott Honor Award for her illustrations in Tops and Bottoms. She explains her process at her VERY INTERESTING website: Janet Stevens. America’s first political cartoon was printed in 1754 in Benjamin Franklin’s The Pennsylvania Gazeteer. The cartoon depicted a snake cut into pieces. 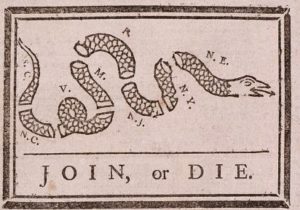 The words “Join or Die” finished the cartoon. The point of the cartoon was that the colonies had to join together against the British. At that time some people believed that a cut-up snake would come to life again if the parts were assembled before sunset. 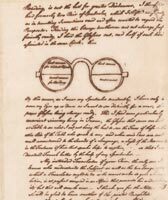 Benjamin Franklin introduced bifocals in 1785. Children can learn about some of his other inventions at: Ben Franklin.